The faculty and students of Berklee School of Music and Boston Conservatory at Berklee teamed up last week at the Berklee Performance Center for “Schuller: A Musical Celebration,” a celebration of Gunther Schuller’s jazz arrangements, classical chamber compositions, and a third-stream work. It followed an earlier recognition last month (see BMInt’s “Heply Digging Schuller”). Berklee’s Dean of Professional Writing and Music Technology Division Kari Juusela began by extoling Schuller’s friendship with Berklee and the shared ideal of musical openness; furthermore, he presented those unfamiliar with his career a lengthy list of credentials taken from the 2015 MacDowell Colony Medal biography awarded posthumously to the composer and mentor (here). With a large constituency of students in the audience, another younger generation experienced firsthand the influence of this iconic Bostonian. The program encapsulated the various degrees Schuller Schuller swung between jazz and classical to bridge this seemingly dichotomous relationship. To start things off, the Berklee Concert Jazz Orchestra performed Blue Moon, an arrangement by Schuller, and Moondreams, a track from the iconic Birth of the Cool (1957), in which Schuller performed as hornist in the 1950 recording session. A significant feature of Schuller’s classical works are his expansive timbral colors through instrumentation, and the inclusion of two French horns and tuba into the full big band configuration came from that similar aesthetic (and also from an influence of Claude Thornhill’s orchestrations). Blue Moon, with its placid beginning and harmonic swells, introduced a relaxed side of Schuller for the night. The notes luckily included an excerpt from his loquacious autobiography explicating the difficulty of recording the complex coda of Moondreams cohesively. Led by director Greg Hopkins, the ensemble navigated these harmonic and contrapuntal difficulties to great effect. As a drastic change in the sonic environment, saxophonist Eric Hewitt and pianist Yoshiko Kline gave the two-movement, subtly jazz-inflected Sonata for Alto Saxophone (1999). Like Phantasmata, the other duo on the program, it highlighted the Schuller’s mindset when working in the duo format: he refused to think about one instrument accompanying the other. Although an unusual decision in most circumstances, Hewitt’s decision to sit for the sonata reflected Schuller’s concern for partnership. Hewitt, a former assistant to Schuller, immediately switched roles to conduct the Boston Conservatory Sinfonietta in the thoroughly third-stream Transformation (1956). The wonderfully expansive and dense initial chord prepared the audience for the work’s color palette. Schuller’s somewhat verbose printed words concern finding a foundation in strictly classical techniques while attempting to break the oppositional tension with jazz. The ensemble successfully recalled the composer’s relationship with the Modern Jazz Quartet, while gradually incorporating fragmented swing elements until we find ourselves in the solo section. Well-rehearsed and formally aware, the ensemble traversed from open Crumb-like textures to the straight-ahead passages led by the skilled rhythm section. Phantasmata (1989) for Violin and Marimba, one of the highlights of the concert was performed by the commissioning duo of Sharan Leventhal and Nancy Zeltsman, who are both Berklee and Boston Conservatory faculty. A huge force for contemporary music as performers and educators, they perform as Marimolin and have been a primary influence in expanding the repertoire for this specific duo configuration. Phantasmata is another duo in the truest sense: this veteran duo executed the fantastically wild, intersecting lines and spontaneous gestures with flair and ease. The Berklee big band then brought a composition by the director Greg Hopkins entitled “12-17”, which pays respect to the 12-tone melodic language that Schuller introduced to so many jazz musicians around the country. A lively rambunctious tune, Hopkins wrote the composition while still a student at Michigan State University; it shows how Schuller the techniques of 12-tone music, canonic imitation, and modern harmonic layers to jazz composers. In the numerous improvised solos, the inquisitive students explored this idea of chromaticism through playing with large non-triadic intervals within the changes. 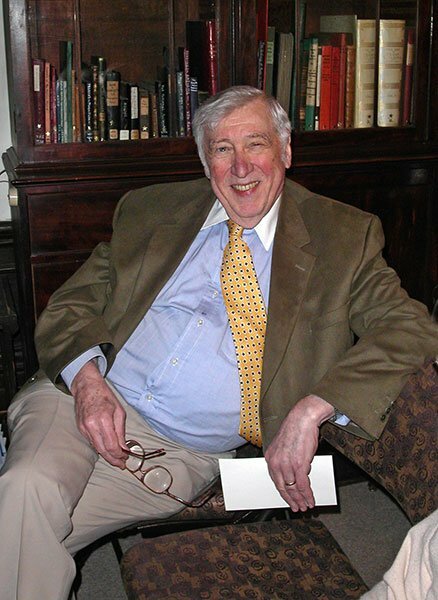 Introduced with great respect and honor, pianist Ran Blake, a longtime friend, student, and colleague of Schuller, offered a how own unaccompanied“Schuller. Noir.” While much of the music of Ran’s focuses on the harmonic density, many of melodic fragments and quotes from Schuller to Kern’s Laura carried through the evocatively dark hall. The Berklee big band concluded the event with arrangements of Schuller that represented the huge Ellington-Gil Evans influence , while simultaneously revealing his own confidence by incorporating the 20th century modernism into the moving textures. Summertime and Yesterdays, along with the opening work Blue Moon, come from the 1988 album Jumpin’ in the Future which featured Boston’s own big band Orange Then Blue. The album’s inception derives from the discovery of a collection of unrecorded charts Schuller’s son and jazz drummer George Schuller—who was in the audience—found while rummaging through piles of manuscript paper. Led by director Greg Hopkins, who himself performed trumpet on the album, the Berklee group brilliantly embraced these difficult charts. Summertime, for small jazz ensemble, featured trumpet player Robert Vega-Dowda’s sensitivity and radiance in the challenging written-out solo. The beautiful muted horn accompaniment and restrained dynamics of the group reflected Schuller’s cool. The obfuscated chromatic excursions and chordal extensions are not to be taken lightly, and the ensemble maneuvered through them with some difficulty. Yesterdays reminded us of the full big band as with Schuller’s striking color palette. This exciting tune, with numerous solos and a double-time section, concluded the tribute with an impressive energy. Berklee faculty Margaret McAllister organized this fine tribute, which provided unmistakable evidence of how this music can function as a practical pedagogical tool to push musical thought and experimentation. Hopefully this concert, coinciding, as it does, with the recent merger of Berklee and Boston Conservatory, created conversations between the once-separate artistic worlds which Schuller worked to unite.